Fariba Dayhim and Shahram Pourmomtaz purchased the old St. Mary's Church in Orono, as well as the convent and rectory next door, and have spent the past eight years renovating them. Nearly 10 years after the last Mass was held at St. Mary’s Catholic Church in downtown Orono, the historic Gothic revival building will this week reopen to the public as a performance and event space. The church was purchased in 2010 by Fariba Dayhim and Shahram Pourmomtaz. The couple, who had recently moved to Orono after Dayhim began working as a surgeon at Eastern Maine Medical Center, was searching for a place to live that was, in some way, remarkable. A recently deconsecrated church, with rectory and convent buildings next door, certainly fit the bill. As as part of the landscape of downtown Orono for more than a decade, countless parishioners have been through the church’s doors — and many more thousands of area residents and UMaine alumni have driven or walked past it over the decades. Despite the enormous of amount of work that went into restoring it, Dayhim and Pourmomtaz believed it was important to do. The plan was to restore all three buildings so they could live in one, rent the other for apartments, and restore the church and use it as a multi-purpose arts and event center. St. Mary’s was built in 1905 by architect Victor Hodgins, who designed a number of well-known buildings in eastern Maine, including the Morse Building (now known as Norumbega Hall) on Harlow Street and the Frey, Dugan and Staples Block on Central Street, both in Bangor, as well as the Church of the Holy Redeemer on Mt. Desert Street in Bar Harbor. 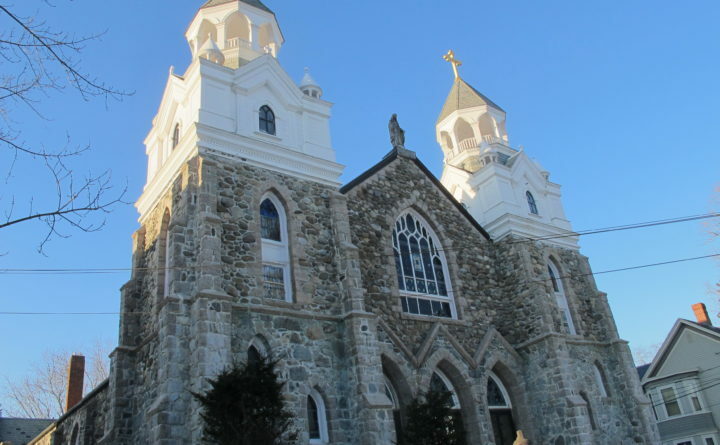 It was built with pink granite and fieldstone, all quarried in Maine. In some places, the stone walls are up to four feet thick. In the main sanctuary there are eight stained glass windows depicting Mary’s story in the Bible, as well as a large half-dome stained glass window above the balcony, facing Main Street. Beautiful though the church is, it was also a major fixer-upper. 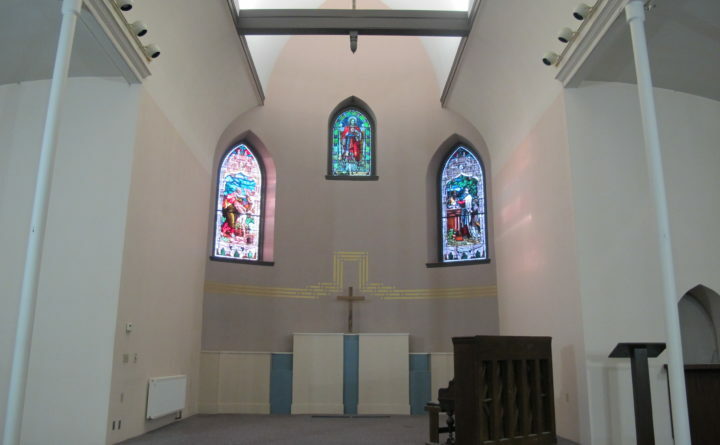 Over the course of nearly eight years, Pourmomtaz and a team of local contractors have fully rewired the church, installed all new plumbing, a sprinkler system, a wheelchair lift, fire doors and a new heating system, repaired the slate roof and repointed the stone walls. The couple declined to disclose the overall cost of the project. The property sold for $355,000. The sanctuary has remained largely unchanged, however, with all the pews, windows and wood accents kept intact. Even the confessionals remain. Pourmomtaz and crew also built a parking lot behind the building, and devised a way to remove the 3,500-pound bell from one of the steeples without actually demolishing it. The bell now sits in front of the church. They also fully renovated the convent and rectory and now have several rental apartment units, as well as their own living quarters. They are currently finishing renovations on the basement reception hall of the church. From the beginning, the couple knew they wanted the church to be open to the public. They have already booked several weddings and other events for the summer and hope to rent out the space — and its acoustics — for more musical and theatrical performances. The first performance planned for the former church, Orono-based True North Theatre Company’s production of “The Lion in Winter,” certainly fits the aesthetic of the space. It tells the fictionalized story of the real 12th century British King Henry II and his wife, Eleanor of Acquitaine, after she returned home from 10 years of imprisonment. Gothic revival architecture, as its name suggests, was inspired by the Gothic architecture of the 12th through 16th centuries in Europe. “The Lion in Winter,” opens Jan. 26 and runs 7 p.m. Fridays and Saturdays and 2 p.m. Sundays through Feb. 4. Tickets are $15 and are available at the door.